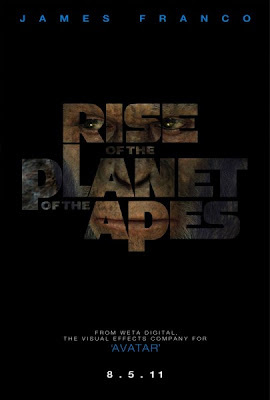 Reel Talk Online: First Look: "Rise of the Planet of the Apes"
First Look: "Rise of the Planet of the Apes"
Okay, first things first: Yes, this is the real title. Second: it actually looks kinda good. Sure, there's been several other remakes to this one movie that won't die (apparently we keep visiting this planet, for Goodness only knows what reason). In any case, this time we follow scientist Will Rodman (James Franco), who tries to find a cure for Alzheimer's disease by testing it first on apes. But, of course, one ape (played by the go-to chameleon actor Andy Serkis) has a real bad reaction to the testing and starts to mutate rapidly, forcing Forman to remove him from the testing. Then, well, check out the new trailer below for a hint of what happens next. Rise of the Planet of the Apes, which also stars Freida Pinto and John Lithgow, invades theaters August 5. Lets hope it doesn't let us down when it comes to the main feature. Looks pretty good, but once again all summer blockbusters look fun, and then turn out to be lame. So who knows with this, but I'm glad to see Franco in a big role here. I just wonder if Franco can carry a summer action film. "the go-to chameleon" - lol. Didn't know that Serkis is involved, especially, in such a part. Actually, I get to know about this summer movie a few days ago. I don't know how I missed it in the earliest news, with such a cast. Is there any movie without James Franco? The trailer does a nice job of peeking my interest. The movie still remains a question mark but this is a good start. The trailer looks great, but man that's a horrible title. Just "Rise of the Apes" would've done the trick, IMO.